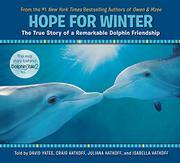 The story of the dolphin called Winter involved a prosthetic tail and was told in books and a movie. But the tale did not end there. Five years later, another baby dolphin is found in great distress very near where Winter was discovered. Again, the dedicated professionals at the Clearwater Marine Aquarium rescue the animal and do everything possible to keep her alive. When she recovers, they make the decision to keep her at the aquarium, naming her Hope, and over a period of years, they train her and nurture her. Knowing that dolphins need companionship, they carefully introduce her to Winter and the elderly dolphin Panama. The three dolphins bond easily, forming a loving group. When Panama dies, Hope and Winter grow even closer, and they are now the stars of the aquarium, attracting crowds of visitors. While the authors are painstaking in their factual account of the events, they also manage to convey a sense of suspense and wonder, as the outcome is never assured. The text is greatly enhanced by color photos depicting many of the exciting events, patient care and joyous playfulness of these good friends. Additional facts about the Clearwater facility and the dolphins aid readers in understanding the extraordinary events.